The Minnesota Land Trust has protected thousands of acres of land in northeastern Minnesota, including a number of properties along Lake Superior. Every year properties are monitored by volunteers or staff, looking for any issues or changes to the land. Two years ago, staff member Mark van der Linden made a surprising discovery while walking along the lake shore on a monitoring visit. Each Minnesota Land Trust protected property preserves something unique, including plants, wildlife, or other important characteristics of the area that should be protected forever. While those characteristics that make the land worth preserving are recorded at the time of the easement, sometimes during monitoring we uncover something new that not even the landowners were aware of. That was the case the day Mark was out walking the property. The response from MBS confirmed what Mark had suspected — the plant was likely Hudson Bay eyebright, or Euphrasia hudsoniana var. ramosior, which is native only to Minnesota, Michigan, and parts of Canada, and is particularly rare in our state. According to the Minnesota DNR, there are only around 68 confirmed occurrences of the plant in our state, only one third of which are on protected state lands. Since Euphrasia hudsoniana blooms generally in late summer, confirmation on what Mark found would have to wait until the following year for an in-person visit. 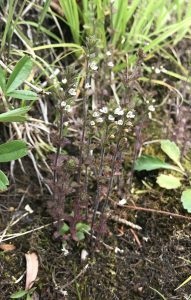 In July 2018 Chel Anderson, Plant Ecologist with the Minnesota DNR, accompanied a Land Trust monitor to the protected property to search for the plant and confirm if it was indeed Euphrasia hudsoniana. “I was eager to see if it was Hudson Bay eyebright and if so, to document another location,” said Anderson. Anderson collected samples to closely examine with a microscope to confirm its identity and document the population if confirmed as the rare species. Within a week Anderson returned the good news that the plant samples were indeed Euphrasia hudsoniana. None of the plants collected were E. stricta or had characteristics indicating hybridization. Invasive plants along the lake shore threaten native plant habitat. With Euphrasia hudsoniana having a limited range and presence in Minnesota, protection of its habitat is critical to its continued presence in our state. Just one third of confirmed observations of the plant to date have been on state land, making conservation easements on private land an important tool in protecting what remains. 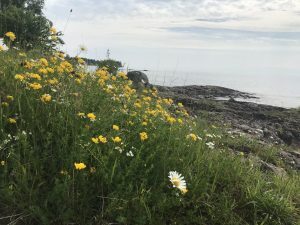 And as for the landowners, they couldn’t be happier to have confirmation of this rare plant, saying they “… are thrilled to be caretakers of this rare find!” Their generous protection of their land will ensure that future generations will be able to enjoy the rare plants and wildlife that grace Lake Superior now. The samples Chel Anderson took from the Land Trust protected property now reside in the Bell Museum herbarium in St. Paul, so that researchers can continue to learn more about this rare plant. With another year of monitoring upon us, we’re looking forward to what else our monitors might uncover on protected land across our state! What is Hudson Bay eyebright? Euphrasia hudsoniana var. ramosior is an arctic-alpine plant persisting in Minnesota as a relic from the arctic climate that was present in the state immediately following the last glacial ice retreat ~10,000 year ago. In Minnesota, it only occurs in habitats closely associated with the shores and islands of Lake Superior. One of the earliest collections was made in 1878 by J. H. Sandberg in Lake County from the rocky shores of the lake. In Minnesota, E. hudsoniana var. ramosior occurs only in close proximity to the shores of Lake Superior, in habitats shaped and climatically influenced by the dynamics of the lake.